Continual, accurate Suspended Solids measurement is crucial for monitoring the performance of your aeration and treatment systems, and reacting to changes in water quality and processes quickly. One of the questions we get asked often is why we measure Suspended Solids. We’ve answered that in a previous blog here. Why Choose a TurbiTechw² Sensor? Our range of TurbiTechw² Sensors are fully automated and self-cleaning; a design we have been perfecting since 1980. Once set up and calibrated using our 7300w² monitor these sensors can be set up for short, regular cleaning cycles with no smearing and minimal disturbance to the measuring process (less than 0.5% down-time). The self-clean action is a popular feature as it means our customers need not intervene or employ expensive cleaning methods themselves, saving time and money. The LA (Light Attenuation) Sensor is best used in aeration/water treatment systems to measure Suspended Solids (aka Mixed Liquor Suspended Solids) where the density is expected to be between 2,000 mg/l and 8,000 mg/l. When to Use the TurbiTechw² HR Sensor? We recommend to use the HR (High Range) Sensor in wastewater treatment systems due to its shorter path length allowing it to measure MLSS values of between 8,000 mg/l and up to 50,000mg/l. When to Use the TurbiTechw² LS Turbidity Sensor? This sensor has been specifically designed to monitor final treated, portable and filter water. 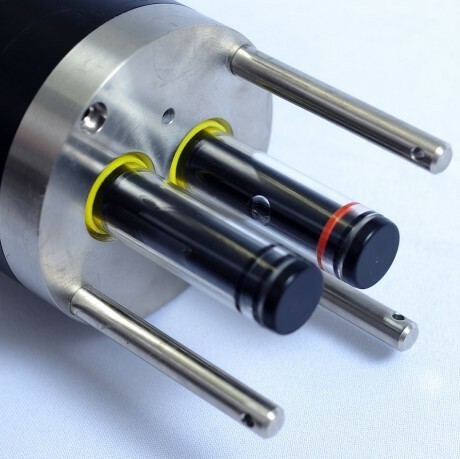 The sensor is extremely sensitive and is capable of discriminating changes in Turbidity of less than 0.1 FTU. Although Turbidity and Suspended Solids can often be confused, they are different in how they are measured, for example, the units they are measured in (Suspended Solids is measured in milligrams per litre (mg/l) whilst Turbidity is measured in Nephelometric Turbidity Units (NTUs) and Formazin Nephelometric Units (FNUs). Find out more about how and when we measure Turbidity. These different sensors are essential for ensuring our customers get the most accurate results for their individual treatments. Pairing the TurbiTechw² sensors with our 7300w² monitor makes for an extremely efficient self-contained system for your site. Call us today to find out more about our TurbiTechw² sensors and speak to a specialist to discover which sensor best suits your requirements. “Strong of its 50 years of existence, the Partech Instrument company is the good partner for the measure of liquid analysis because of the reliability and the accuracy of their products"